Skills and abilities: Self trained martial artist. Gifted choreographer and criminal mastermind. Technology: She carries with her a whip which can discharge electricity and impose her will on those ensnared. It is called the “P-whip”. The self styled archnemesis of BuckWild, Mercenary Man. 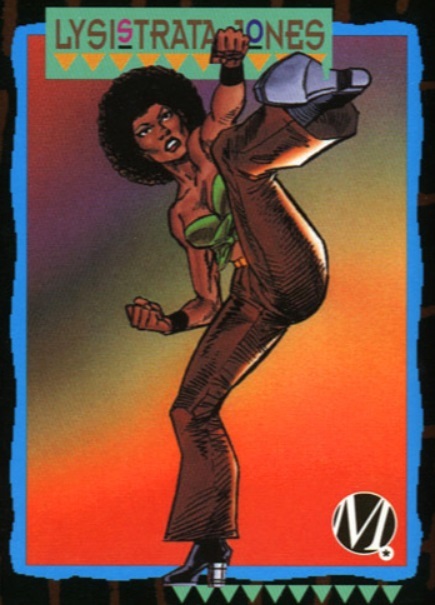 She developed a unique but effective fighting style from viewing countless hours of cheesy martial-arts films. After a similar marathon session of viewing a series of ‘Blaxploitation’ films, she decided to become the “Black Queen of Crime” (or ‘Queen of Black Crime,: she’s still deciding which). In addition to her criminal genius, she is a talented choreographer (Milestone Skybox card #53, 1993). She met Buckwild at some undisclosed point in the past. He tried to thwart her latest plan by taking out her gang but she escaped after ensnaring him with her ‘P-whip’. She used him to attack Icon and Rocket but they freed him from her control. When they tracked her down she ensnared Buckwild again and Icon. Rocket was the one to take her out and hand her to the cops (Icon #13). After Buckwild died she showed up at his funeral distraught over his passing and suggests she may have loved him (Icon #30). It’s unknown what happened to her afterwards.